A new study paints a depressing picture. It comes as skier numbers fall in Switzerland and ski schools report a reduction in the numbers of learners. The new study comes from an analysis of satellite images by researchers at the University of Geneva and at the United Nations GRID-Geneva environmental data centre. 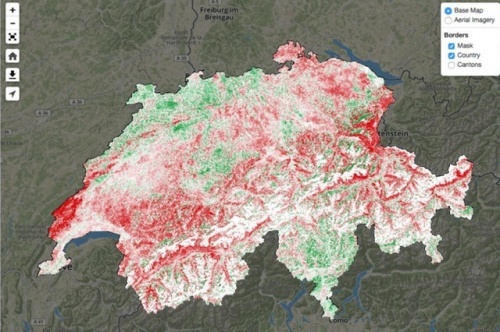 It shows how much snow cover Switzerland has lost in the last 20 years. In the past almost two-thirds of Swiss territory was covered by snow; now it is only about half, according to satellite data gathered over the past two decades. The study shows that the area of Switzerland given over to permanent snow shrank in the period studied - from 27% over the 1995-2005 period to 23% from 2005 to 2017. The loss is some 2,100 square kilometres, which is an area seven times larger than the canton of Geneva. "Beyond the economic issues related to tourism, other questions arise such as flood risk management or water supply, given the storage role that snow plays, retaining water in winter to release it in spring and summer," said the researchers. The main reason is global temperature rise. Here at PlanetSKI it is the snow for skiing that is our primary concern. "Last winter was exceptional but by and large we have noticed a decline in the last decades and particularly in the size of the glaciers," said the PlanetSKI editor, James Cove. "It should be pointed out that though the study is about Switzerland there is likely similar data and conclusions from the other parts of the Alps and it is not just confined to the Swiss Alps." The bad news for Switzerland is that it also comes at a time of falling holiday skiers, caused partly by the poor exchange rate and high prices. There was an exodus of British ski companies a few years ago. The end of the Swiss chalet holiday? "Very few of the UK ski travel operators actually run chalet programmes in the Swiss Alps anymore though they do send guests to hotels," added James. The snow research comes as new figures for people taking ski lessons with the main Swiss school are released. The ski school statistics are from the ESS, Ecole Suisse de ski. Nationally over the whole season it has lost over 1 million ski lesson hours since 2008. While the number of skier days across the whole of Switzerland has shrunk from nearly 30,000,000 to just above 20,000,000.